Man is by nature progressive. ‘Medha’ (talent) is the basic foundation of all development and progress. Every human being is gifted with one or the other hidden talents. Some excel through intellectual talent while others through sports. Some exhibit extraordinary talent in solving mathematical sums while others are scientist par excellence! Some are good at creative art while others in spirituality. Although all people do not possess same level of talent, it does exist in everybody in some or the other form. The question is how we can awaken our hidden talents and potentials and explore, realize, and exploit those for our own benefits and the benefits of the human kind at large. It is an important principle of knowledge management. Although, everybody earns knowledge from some or the other source, but there are few who can imbibe and web that knowledge into their own lives and actions. Although, everybody tries to their level best to be talented, yet it never happens. Only those who tirelessly stride to earn and manage knowledge can succeed in becoming talented. The true meaning of ‘medha’ is not restricted to illustrate only good grasping power and knowledge management, but in essence, is very elaborate and significant. ‘Medha’ brings in creative transformation in a person’s life. It is ‘medha’ which tells us what is good and what is bad! The realization of our rights and duties is also through ‘medha’. In other words, ‘medha’ is the fruit of knowledge. Kakcheshta means-similar to a thirty crow who keeps struggling for water to satisfy its thirst, a student must work tirelessly to earn knowledge. Swannidra means- similar to a dog which sleeps very less and remains alert, a student must not become lazy and remain attentive all the time. Swalpahaari means- since food could be both nourishment as well as addiction a student must avoid eating too much. Striyastyagi means-a student must practice self-restraince and observe celibacy. a) Intrinsic talent- as mentioned above, each one of us possess some or the other talent with in us. If we are aware of our talents, then we can easily set our goals and succeed in achieving those goals. b) Aptitude/Hobbies/interests: All of us have some natural and acquired hobbies and interests. If we work dedicatedly to keep our hobbies and interests, we can succeed and enjoy a fulfilling life. a) Self-confidence: ‘I can do it…’ reflects the happiness of our inner self. It boosts our self- confidence. However, one should be conscious of not falling prey to over-confidence. b) Self-discipline: We can sustain and keep our determination only if we can exercise self-control. An alert mind can only stride towards the goal. 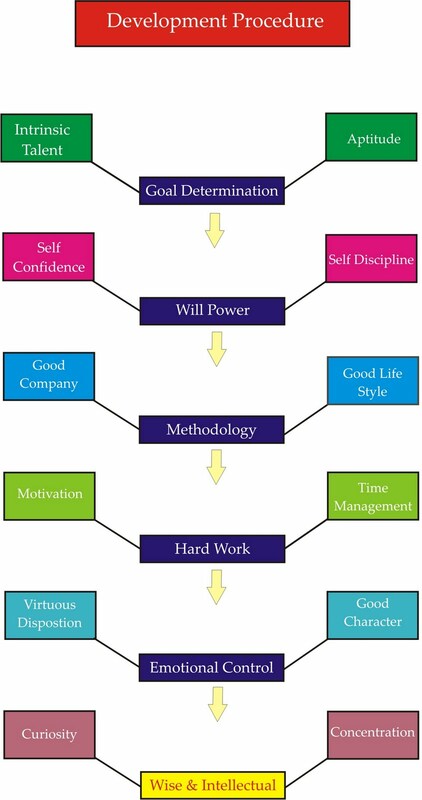 Positive thinking, good analyzing power, and control over sleep are main components of self-discipline. a) Good company: Circumstances exert great influence on outcome. As correctly said ‘great man had great teachers’. Company can make or spoil. Hence, one should be careful in making choices about friends because one sick fish can spoil the entire pond. b) Appropriate life style: Our body has a clock called biological clock. The life style of a person is largely determined by his daily routine. Only a person with correct life style can follow a correct methodology. a) Right motivation/inspiration: Inspiration encourages. It revives zeal and imparts fresh enthusiasm. Inspiration helps overcome fatigue and boredom. b) Time management: Time is precious. Correct knowledge of priorities and time management is essential for achieving success. Only through right time allocation, hard work can fetch fruits of success. Early morning is recommended for serious, in depth studies, while afternoon and evening are suitable for light study. a) Virtuous dispositionI inbred nature/ethics/idiosyncrasy: Inbred nature plays key role in the process of emotional development. Concept of the entire Indian civilization revolves around the theme of inbred nature. Inbred nature serves as a guiding torch in all situations. b) Effulgent character: Character is the essence of life as aptly said ‘if money is lost, nothing is lost, if character is lost, everything is lost!’ Pure effulgent character is possible only through self control over emotions. a) Curiosity: Curiosity is the mother of knowledge. It keeps the student preoccupied, active and makes him a studious scholar. b) Engrossment: Work accomplished with full immersion and absorption leads to success. Mental concentration imparts happiness and alleviates physical fatigue. As long as our thoughts are inconsistent and energies scattered, we can not achieve success. Good mental concentration is indispensable for achieving success. People greatly differ at the level of ‘medha’ development. ‘Medha’ is directly proportional to the level of talent development. In other words, level of ‘medha’ rises with more and more development of the talent. 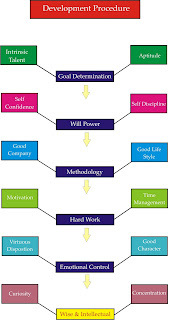 Based on the developmental stages of talent, ‘medha’ can be divided into 5-levels. 2. Memory power: It means long-term storage of knowledge. Experiments aimed at improving the memorizing power can help at this level of ‘medha’ development. A person with weak memorizing power can not move up in the ‘medha’ hierarchy. 3. Understanding power: Only well understood knowledge can become part of habit and useful. Good understanding power can make judicious use of memory power. 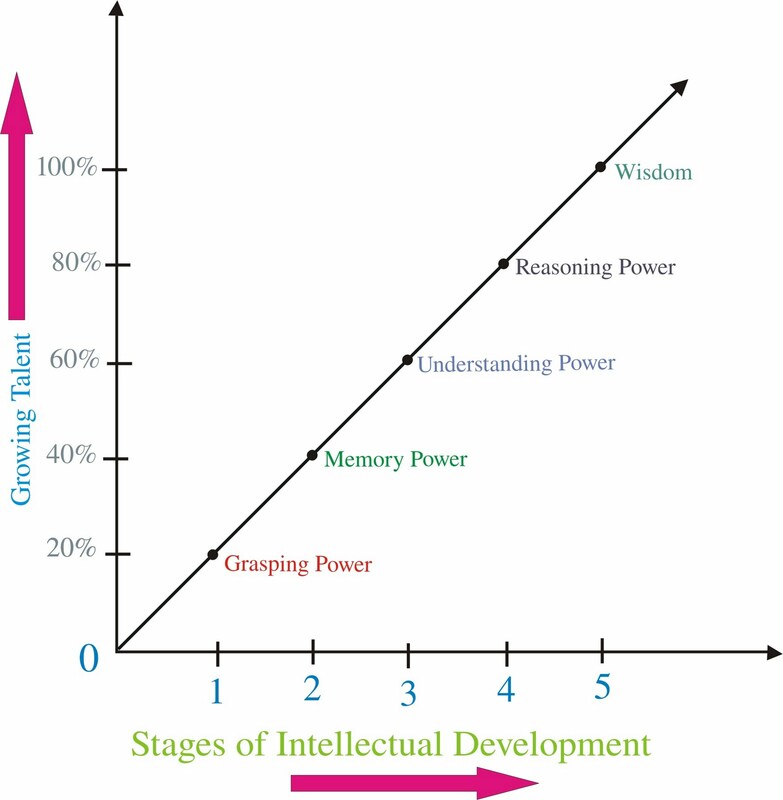 Reasoning/logical power: The modern era is an era of intellect and logical power. Reasoning power has been the basis of our all round development. It is the foundation of law and philosophy. In the absence of grasping power, memory power, and understanding, reasoning power can not flourish. All four levels of ‘medha’ (i.e. 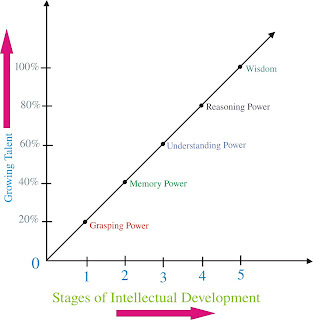 grasping power, memory power, and understanding, reasoning power) are required to build good analyzing ability. Wisdom: It is the highest level of ‘medha.’ It is the level at which wisdom is awakened. The first 4-levels of ‘medha’ described above can make a person intellectually powerful yet not emotionally well equipped enough to handle difficult situations of life. It is at this 5th-level of ‘medha’ that person becomes capable of finding solutions to his real life problems. There is a popular saying ‘winners do not do different things, they do things differently.’ In other words, we all work. We all have same 24-hours a day. We all have same type of body, same number of hands, legs, ears, eyes, etc. then why some people are ‘medhavi’ while other are not? How can we identify and distinguish ‘medhavi’ from ‘ordinary ones’? Verbal communication: A ‘medhavi’ has uniquely impressive style of verbal communication. Listening power: A ‘medhavi’ knows the difference between hearing and listening. While majority of people just hear without actually diving deeper into the meaning, a ‘medhavi’ tries to imbibe the root meaning of what he hears. A’ medhavi’ also makes himself free from the bondages of sorrow and mental stress. He remains poised and neutral under all circumstances. Although, human life is precious and rare still rarer is an opportunity to get educated and develop talent. One who honors the opportunities and strides to develop talent becomes ‘medhavi’. There are different levels of ‘medha’. The highest level of ‘medhavi’ is one who has learned to balance his emotions, awakened his wisdom, and is progressing towards a spiritual destination. its extremely knoldgeful $ i would like to thanx those who r involved in this task.